This facility addition, located in Zentech’s Baltimore location, will be utilized for final assembly processes of precision optics to support leading-edge biometric technologies for a wide range of government and commercial applications, as well as for mainstream Physical Identity Access Management (PIAM) applications. 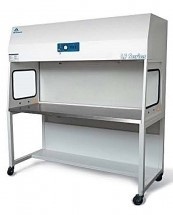 The clean room features Air Science Purair LF Hoods that are ISO 3, Federal Class 1 rated. ISO cleanroom classifications are rated by the amount of airborne particulate matter existing per cubic meter. Air Science Purair Laminar Flow Cabinets are a series of high efficiency products designed to protect equipment and other contents of the work zone from particulates. At the heart of the cabinet product line is the specialized filtration technology that creates a clean work environment over a wide range of applications. Zentech is a premier electronics contract manufacturing company offering PCB (Printed Circuit Board) Design, SMT Assembly, and PCBA Testing Services.